Sony Corp. (SNE) hasn't had a consumer-electronics hit since the Walkman. It's in such dire straits these days, in fact, that its decision to slash the price of its PlayStation 3 game console is wholly unsurprising. The company reported awful earnings for the first quarter, dragged down by its PS3 game system -- losing ground to its rivals, Nintendo's (NTDOY) Wii and Microsoft's (MSFT) Xbox. Approximately 1.1million PS3 and 1.3 million PSP units were sold, down from a year earlier. Sales in Sony's game division also declined, although the Japanese electronics giant had high hopes for its first-person shooter game, Killzone 2, to boost market share. Will shaving $100 off the PS3 boost the conglomerate's fortunes? It's too soon to tell. Jesse Divnich, director of analyst services at Electronic Entertainment Design and Research, told USA Today that the price cut makes PS3 competitive with its main rival, the Xbox 360. "However, this is not to suggest that hardware sales will suddenly shift into Sony's favor," he said. "It would be safe to assume that this recent price cut will slowly begin to close the gap between the two consoles." 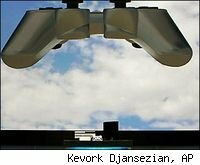 Our sister blog Engadget points out that Sony is marketing the fact that the new PS3 will run more quietly than existing systems, which is good for people who like to watch movies and play games at the same time. For folks less adept at multitasking, there's always the Wii.